The final races begun at 11:00 and the last starts were given just a little bit before 15:00 o’clock. “The last racing day showed us very clearly that the competitors were very tired. The female sailors in the Optimist class were called back three times and 20 girls got a black flag start. A false start was done also in the Europe class and two races were held instead of three. Luckily the golden fleet races in the Optimist class were carried out without mistakes, because the leaders wanted to preserve their positions,” said Marko Saarlaid, the Race Officer. Among the male sailors in the Optimist class the victory went to the Latvian Martins Attila, who won six races out of nine. The second place went to Lado Krensler from Sweden and the third place to Eduards Plavins from Latvia. Altogether there were 101 male sailors in the Optimist class. Among the female sailors in the Optimist class the goldmedal went to the Xiaoijan Keinänen who is from Finland. The second place went to Diane Ninuave-Jutulstad from Norway and the third place to Filippa Henriksson from Sweden. Altogether there were 80 male sailors in the Optimist class. Among the male sailors in the Europe class the victory went to the Ilari Muhonen, who is from Finland. The second place went to Axel Laine, who is also from Finland and the third place to Axel Burline from Sweden. Among the female sailors in the Europe class the gold medal went to Laura Pesola, the second place went to Martta Soini and the third place to Saara Kuisma. All three are from Finland. 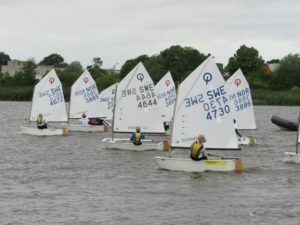 The Nordic Youth Sailing Championships started on the 24th of July. On the first day the practice race’s were carried out, the races were organized Wednesday and Thursday and the finals on Saturday. On Friday the audience was thrilled by the spectacle of “Team race” races, where teams from different countries could compete. At the formal ending ceremony the commodore of Pärnu Yacht Club, Mr. Väino Hallikmägi, said thanks to everybody who competed, who organized the races and also to the parents of the young sailors. He ended the ceremony saying: “I hope that in a few years time we will again host the very best of the young sailors here”. The Nordic Youth Sailing Championships were held by Pärnu Yacht Club in collaboration with Estonian Yachting Union. The event was supported by Pärnu Municipality, Sportland Eesti AS (Helly Hansen), AS Pomarfin, Pärnu Keskus and Pärnu Water.